In 1995, Nintendo released Panel De Pon on the Super Famicom. It was something akin to an inverse Tetris. A falling-block puzzle game where the blocks ascended from the bottom of the screen, as opposed to falling from the top. 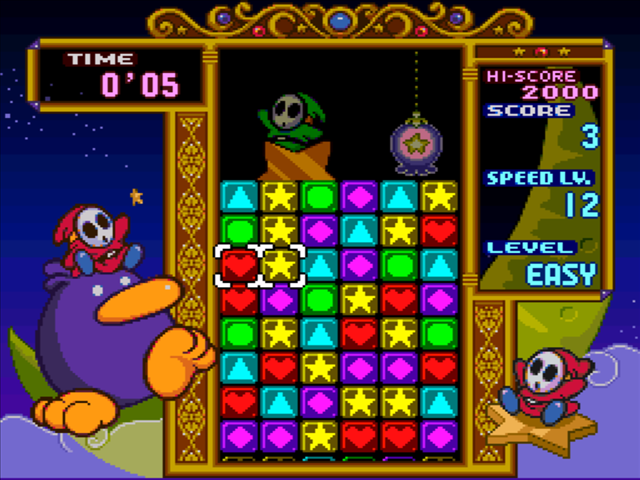 In 1996, Panel De Pon was brought stateside under the name Tetris Attack, swapping out the original Panel De Pon characters with a motif based on Yoshi’s Island. The game was later re-released on the Nintendo 64 with yet another new title, Pokemon Puzzle League, using characters and visuals from the Pokemon anime. While Pokemon Puzzle League is the version that has seen subsequent releases through Nintendo’s downloadable services, the Yoshi’s Island aesthetic makes Tetris Attack the most endearing version of this overlooked gem of a puzzler. As stated, despite having the name Tetris in its title, Tetris Attack works as a reversed version of the falling-block puzzle genre made famous by Tetris. Here, the blocks all rise up from the bottom of the screen. Nor do these blocks come in different shapes. Instead, they are all bricks adorned with different colors and symbols (like red blocks with hearts, yellow blocks with stars, and blue blocks with diamonds. The player moves a cursor around, which looks like two squares clumped together. The player moves the cursor up, down, left and right with the D-pad, with the A and B buttons being used to swap whatever two blocks are within the cursor. By moving the blocks around, players are supposed to line up at least three blocks of the same color (either horizontally or vertically) in order to eliminate them and prevent the blocks from reaching the top of the screen, which results in a game over. But wait, there’s another twist to the formula at play. If you manage to chain four or five blocks of the same color together, or get an ongoing combo going, you’ll drop what’s called a “garbage block” on your opponent. Garbage blocks make things more difficult for whoever ends up with them. Players eliminate the garbage blocks by completing a series of blocks adjacent to the garbage block, which then turns into a series of regular blocks. Additionally, rare exclamation point blocks may appear, and if you manage to chain them, you’ll drop a metal garbage block on your opponent, which is even tougher to get rid of. Like most of the great puzzle games, the gameplay is instantly understandable, but so well executed that you could play it for hours at a time. Tetris Attack will have you thinking and strategizing on the fly, racking your brain to find the quickest combos possible. It’s insanely fun. 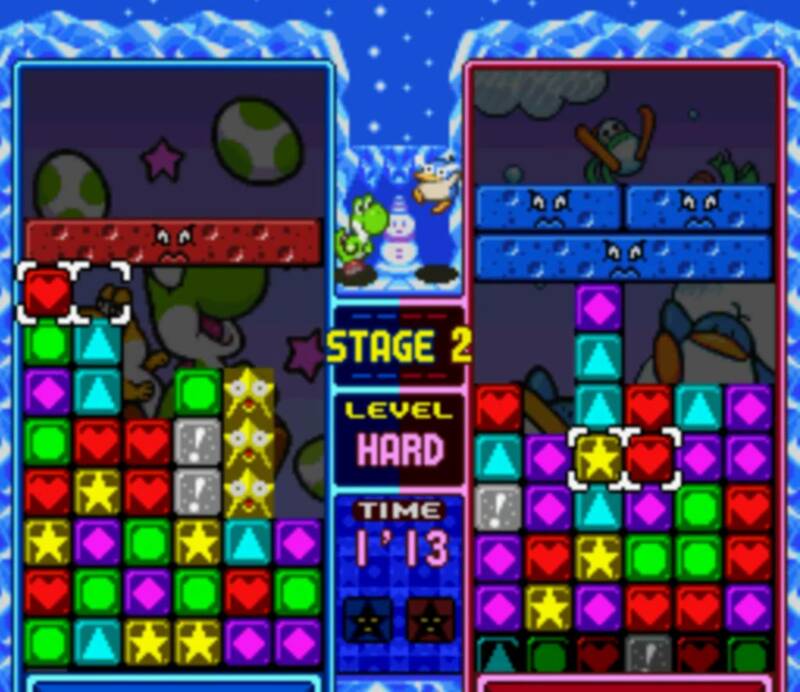 Tetris Attack features a host of different modes, such as endless (where you simply play and rack up points until the blocks inevitably take over), and the oddly-named Versus Mode – which is more of a story mode – where players control Yoshi as he battles his friends (such as Poochy and Lakitu) to free them from a curse, and then take the fight to Bowser and his minions (in which all of your freed allies serve as additional tries). The single player modes are all fun, but no doubt it’s the multiplayer that will keep you coming back. Tetris Attack is one of the most fun puzzle games I’ve played, and if you have another player willing to tackle it, you can easily get lost in its action. Once again, the game has seen many different facelifts through the years. 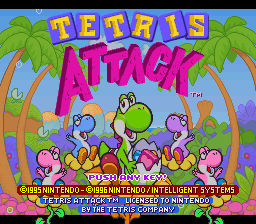 And while the core gameplay remains the same in each iteration, Tetris Attack serves as a testament to the appeal of a franchise name, because – as stated – the Yoshi’s Island characters and visuals make it the definitive version of the game. Sure, playing the game under any of its guises is fun, and if you can more readily play it in one of its other forms, go for it. But there’s just something so charming about the Yoshi’s Island aesthetics, that it gives the game its cutest, most appealing packaging. Tetris Attack even includes some great remixes of Yoshi’s Island tunes, as well as some stellar original music, which is refreshingly peaceful and calming. Until, of course, the blocks raise too high, and the music becomes more appropriately hectic. Tetris Attack is pure fun. It remains one of the best multiplayer titles of the 16-bit generation, and is one of the most addictive puzzle games around. The Panel De Pon formula is something special in the falling-block genre, and wrapping it up in a Yoshi’s Island motif just makes it all the sweeter. Wizard Dojo looks at one of the best puzzle games ever. So, inverse tetris with a part of puyo pop? My favorite of these kind of games has to be puzzle bobble, always enjoyed the approach that has over the rest. Classic puzzle game! I never had this game growing up, but I wish I did. The Yoshi’s Island design combined with Panel de Pon would have won me over as a kid. I did eventually pick up the SNES cartridge a couple of years ago, since it looked like Nintendo was never going to release it on Virtual Console. I’m glad I did. It’s as fun as you say! Great review! This was the first video game to introduce Yoshi to everyone.